As a participant at the German pavilion, Instrument Systems is showcasing its premium class spectroradiometers at Photonics West / USA. The globally recognized reference device CAS 140D forms the basis of the system and is supplemented by our special model, the high-resolution CAS 140CT-HR. Both devices can be viewed in simulated applications at exhibition booth 4545-38 from 5–7 February 2019. In combination with various accessories, the color coordinates, color temperature or color rendering index of LED modules and displays can be measured with the highest level of precision. As they are particularly stable and reliable in operation, the array spectroradiometers of the CAS series are ideally suited to 24/7 use in the production line. The design of the CAS 140CT-HR is specially aligned to the measurement of narrow-band emission sources such as laser diodes or VCSEL. The extremely high spectral resolution of up to 0.2 nm half-band width and particularly short integration times as low as 9 ms permit fast testing in the laboratory and production. Instrument Systems supports the optoelectronics industry in innovative product development by supplying state-of-the-art equipment for light measurement. This also holds true for laser light sources that are constantly gaining in importance for scientific and high-tech applications, e.g. autonomous driving. Instrument Systems developed the CAS 140CT-HR high-resolution array spectroradiometer specifically for the absolute characterization of narrow-band emission sources. It delivers measurement results with a high spectral resolution of up to 0.2 nm half-band width, accompanied by short measurement times as low as 9 ms. Above all, the CAS 140CT-HR offers decisive advantages compared to conventional technologies for the fast testing of laser diodes or vertical cavity surface-emitting lasers (VCSEL). Dispersive, scanning or Fourier-transformed IR spectrometers (FTIR) have movable parts that react sensitively to production vibrations. The CAS 140CT-HR contains fixed components and is particularly stable and reliable in operation – making it ideal for exacting tasks in production and the laboratory. 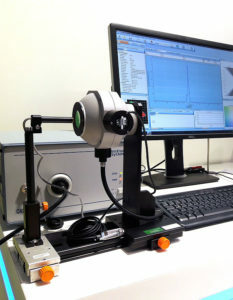 Premium spectroradiometers can be set up as a DTS system for individual display measurements. The light radiation is launched with the TOP 200 telescopic optical probe connected to the spectrometer by an optical fiber. Due to the flexible fiber connector, the measurement adapter can be easily changed and the system quickly configured for other applications, e.g. LED measurement. The system measures, among other things, the radiance and luminance and the color of displays and backlit symbol displays. The DTS system can be universally employed for display technology, e.g. LCD, LED or OLED.